SUNY Oswego, a public liberal arts college not far from Syracuse, guarantees that you get all the classes you need to graduate in four years (as an entering student or a transfer student) or it will provide free tuition for the remainder until you meet graduation requirements. Oswego also guarantees that you will not experience any increase in the cost of room and board for four consecutive years. What is a typical SUNY College at Oswego student like? Describe the type of person that should attend SUNY College at Oswego. 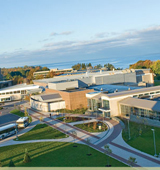 What are the top 3 reasons someone should attend SUNY College at Oswego? The tuition isn't that bad and the food is great! The education is very important and many people after graduating from here go on to successful careers. What was a typical SUNY College at Oswego student like in high school? Describe the type of person that should attend SUNY College at Oswego. With a student body of more than 8,300, we are large enough to offer more than 100 programs of study yet small enough for students to form quality relationships with each other and caring faculty. We stress quality education and experience inside and outside the classroom on our scenic, 690-acre lakeside campus. Students pursue bright futures through programs in our College of Liberal Arts and Sciences; School of Business; School of Communication, Media and the Arts; and School of Education -- as well as innovative interdisciplinary programs that cross traditional boundaries. Oswego opens doors to the future with internships and study-abroad opportunities that rate among the highest in the SUNY system. What are the top 3 things that students do for fun at SUNY College at Oswego? Campus housing is available for undergraduates. Housing deposit : $100.00. Housing deposit due : May 1. Housing deposit is refundable in full if student does not enroll.. Freshman allowed to have car. Pets allowed in dorms. The average student pays $15,558 for tuition, fees, and other expenses, after grants and scholarships. Learn more about financial aid at http://www.oswego.edu/admissions/costs/financial. Estimate the net price for you at http://www.oswego.edu/admissions/costs/financial/net_price_calculator.html. The typical (median) early career salary of SUNY College at Oswego graduates is $35,900, according to Payscale. SUNY College at Oswego participates in the NCAA Division III for college athletics. Want more info about SUNY College at Oswego? Get free advice from education experts and Noodle community members.